This entry was written by Claudine, posted on June 16, 2015 at 10:26 am, filed under bobbin work. Bookmark the permalink. Follow any comments here with the RSS feed for this post. Post a comment or leave a trackback: Trackback URL. Could you explain what you mean by “doubling the thread”? And, how you actually put that doubled thread onto the bobbin? I would love a clearer explanation than the one that is bumbling about in my brain! 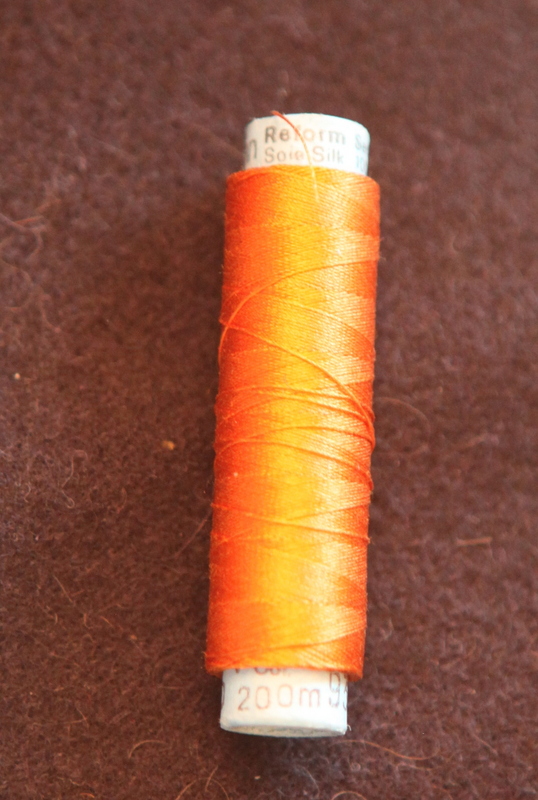 First, I figure out approximately how much thread I need, and pull 2 equal lengths off the spool of orange silk thread. I take both lengths, and, holding them together side by side, wind the bobbin with them by hand. Then, when I put the bobbin in the machine, the top thread will catch both bobbin threads at the same time, making a thicker line of orange. You can also do this with 2 different colored threads for a variegated effect. The machine is threaded at the top with regular cotton thread. Thank you so much for your reply. This sounds like a lot of work, but I am sure that the effects can be worth the effort. I will have to play(always a fun thing to do!) 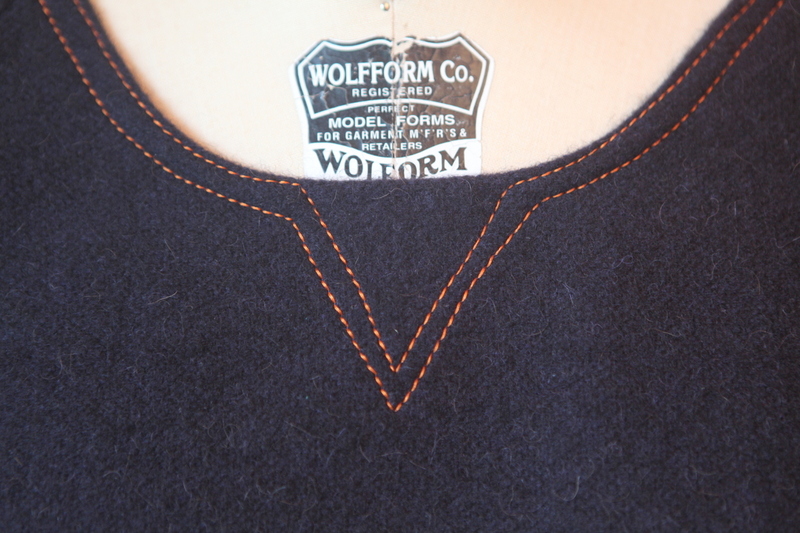 with this technique a bit and find out how I can apply it to my own sewing. Thanks again, and, by the way, your shirt is lovely. This is really beautiful, and of course, it’s all in the details. I love the choices you’ve made. I chuckled at your comment about sewing, or not, for your daughter. 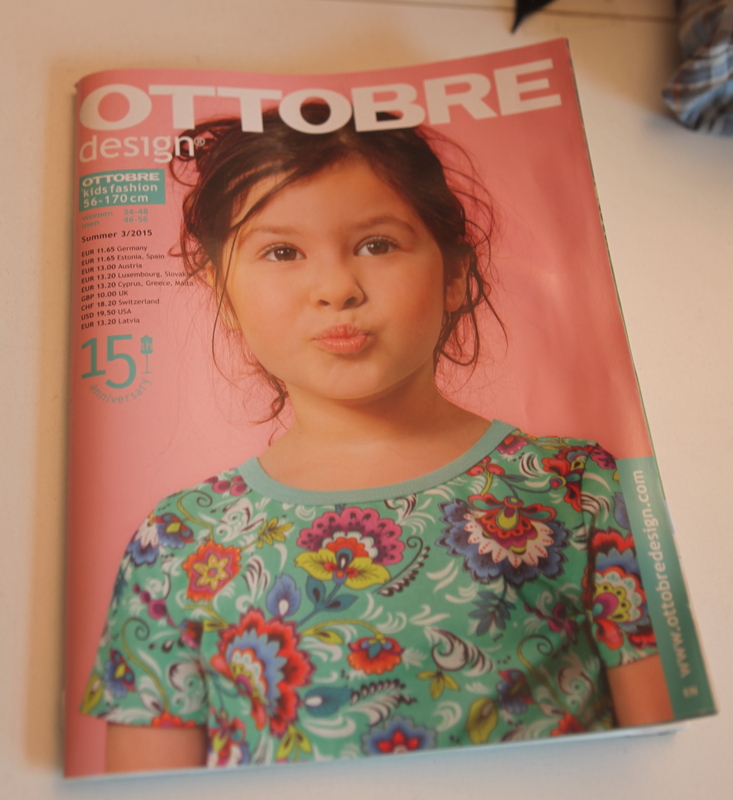 Mine daughter is now 20 and for about the past 10 years there has never been a guarantee that she will like/wear what I sew for her. Thanks! Re putting the decorative thread in the bobbin: sewing machines are made to work with a very specific kind of thread. If you try to thread the top with any other kind of thread, you are just asking for trouble. Glossy silk thread slips through the tension discs like a ninja. Embroidery floss and yarn are too thick to get through the needle. Metallic thread frays under any stress at all. Even if you have an embroidery machine, it’s calibrated to work with machine embroidery thread, and that’s it. So, if you want to work with a different thread, putting it in the bobbin and stitching from the wrong side is an easy way to do it. Great looking top; love the finishing details. Learned something new with you explanation about using specialty threads in the bobbin, thanks! First can I tell you that I’m so copying that topstitching technique! I love how it criss crosses. The sweatshirt is cute! I can see you in this now looking very cool. Thanks. 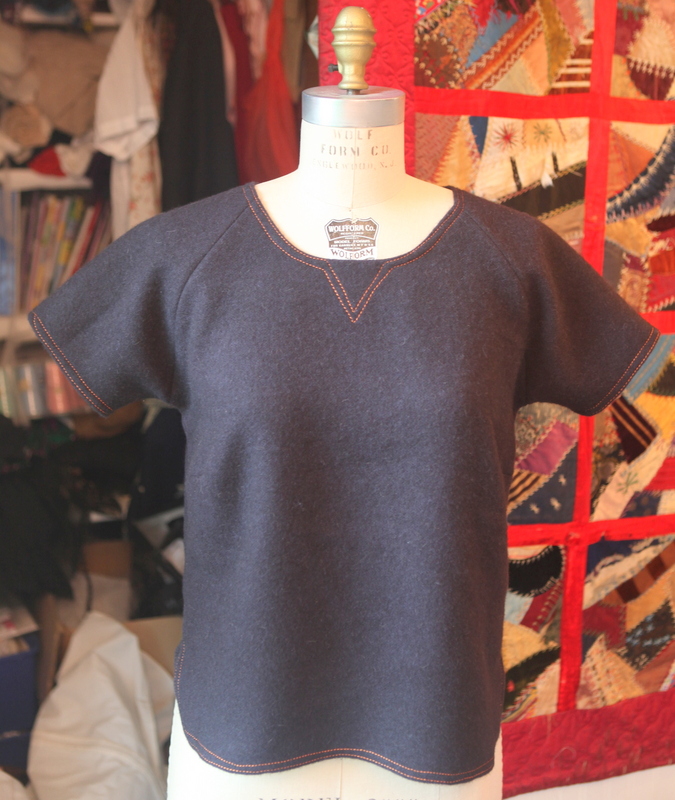 The cris cross is just me being lazy, and wanting to sew the 2 rows of topstitching in one pass. 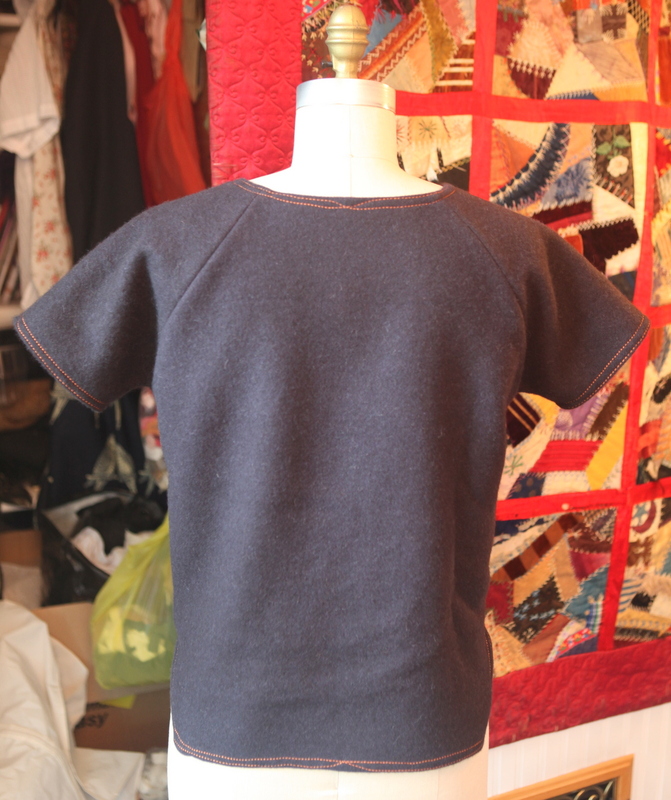 Then when I looked at it at the back neckline, I thought it looked nice, so I put it on the outside of the sleeve. I probably should have pointed this out in the actual blog post, but oh, well. 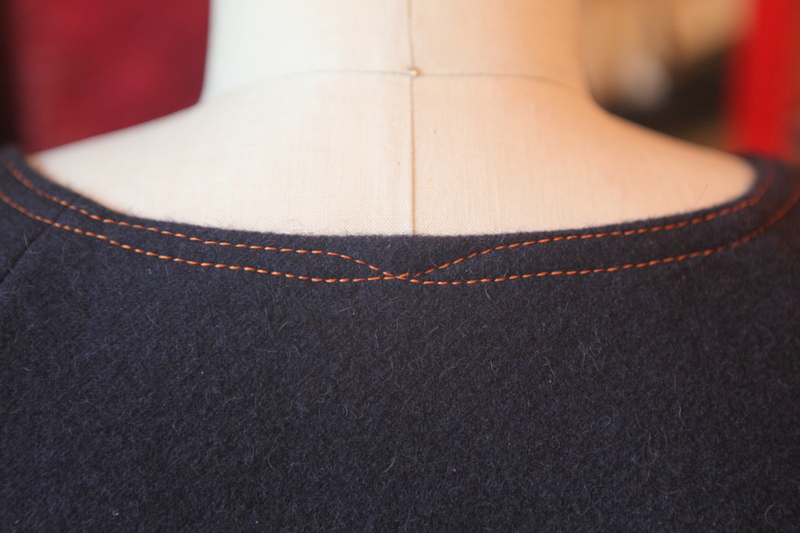 Love, love, love that topstitching! 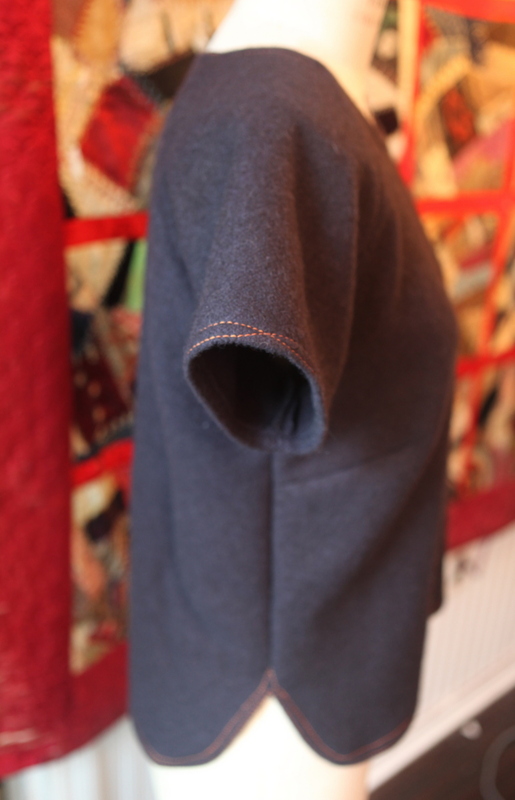 I use heavy cotton denim jeans thread in my bobbin and sew that way too…so nice and chunky without even changing the needle or top thread! Never have tried using double thread but I have loads of cotton quilting thread that will never be used and it might just have to fill up a bobbin or two for a new technique…thanks so much, Claudine! It’s still cool! 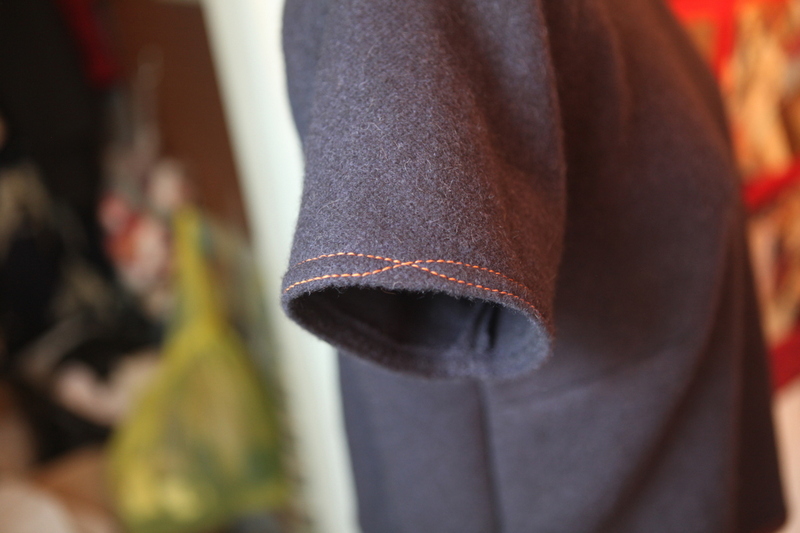 Is it hard to do an FBA for raglan sleeves? No, it’s not hard. It’s pretty much the same as for a set in sleeve. Oh good, I’ll give it a shot in that case!